Democrat presumptive presidential nominee Hillary Clinton has chosen Virginia Sen. Tim Kaine as her running mate, a man who shifted to a fully pro-abortion stance in order to be in sync with Clinton, who believes an unborn baby – up until its birth – has no constitutional rights and can be aborted if that is the choice of his or her mother. Though Kaine has described himself as a pro-life Catholic in the past, the Huffington Post reported that he has moved toward a pro-abortion position since he has been considered a primary contender for the vice president’s position on the Democrat ticket. Though, as a senator, Kaine has opposed defunding Planned Parenthood and restrictions on abortion, in 2009, as governor of Virginia, he signed a bill that created the “Choose Life” license plates that raise funds for pro-life causes. 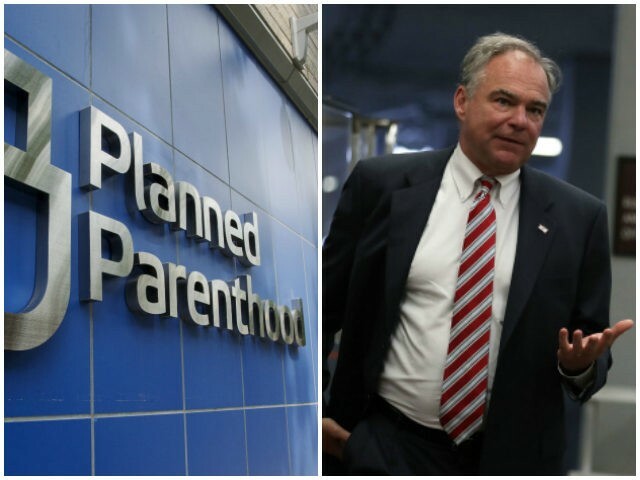 Kaine now says, however, that – in his professional life – he is a strong advocate for abortion rights.
.@HillaryClinton's VP pick @TimKaine earned a 100% rating on the Planned Parenthood Action Fund scorecard in the Senate. In addition to stating that unborn babies have no constitutional rights, Clinton has vowed to work to repeal the Hyde Amendment, a longstanding federal provision that prohibits taxpayer funding of most abortions. Kaine’s full embrace of the pro-choice position is important since abortion will take center stage at the Democrats’ convention this coming week. For the first time, the Party’s platform specifically mentions its defense of Planned Parenthood, the abortion business that is being investigated by Congress for its apparent practice of selling the body parts of babies it aborts on the open market. The platform goes further than previous Democratic platforms on women’s reproductive rights. It champions Planned Parenthood health centers and commits to push back on all Republican efforts to defund it. The platform also vows to oppose, and seek to overturn, all federal and state laws that impede a woman’s access to abortion, including by repealing the Hyde Amendment. It also strongly supports the repeal of harmful restrictions that obstruct women’s access to healthcare around the world, including the Global Gag Rule and the Helms Amendment, which bars US assistance to other countries that provide safe, legal, abortion. Planned Parenthood’s president Cecile Richards noted that abortion – what her abortion business calls “comprehensive reproductive healthcare” – is “central” to the Democrat Party’s platform for the first time, reported the Washington Examiner. “We also applaud the platform for affirming Planned Parenthood’s critical role in communities in the face of unprecedented attacks on reproductive health at the state and congressional levels, and the recognition that reproductive healthcare is core healthcare for women, men, and young people,” Richards added. However, pro-life members of the Democrat Party are denouncing both the platform’s full embrace of abortion and vow to expand taxpayer funding of the procedure. Day said the radical pro-abortion language in the platform is diminishing the size of the Democrat Party. She added that some Democrats have called her to say they will not vote for Hillary Clinton, the presumptive nominee, because of her extreme pro-abortion stance. At least four Democrat U.S. senators claim to object to their Party’s radical stance on abortion: Sens. Joe Manchin (D-WV), Bob Casey Jr. (D-PA), Joe Donnelly (D-IN), and Heidi Heitkamp (D-ND). Fr. Frank Pavone, national director of Priests for Life, criticized the Democratic Party’s draft platform language on abortion.